Our car magnetic stickers are similar to the fridge magnets but they are applied to a thicker magnetic sheet and we also laminate them with clear vinyl. The most common sizes are as follows but custom sizes are no extra hassle as long as the width is below 620mm. 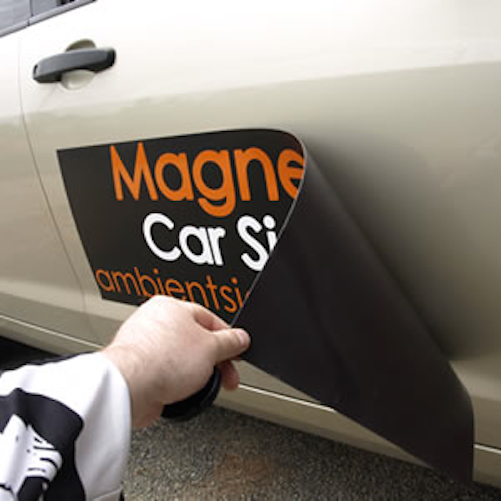 Car magnets are unlikely to damage the paint on your vehicle, unless you do not remove the car magnet for a very long period. What might happen is that small dust particles can come in between the magnet and the surface of your car and then friction might result in tiny scratches. However most modern vehicles use a new paint process which means that it will be very unlikely to damage you vehicle. It would be wise to remove the stickers before you wash your vehicle and to insure that your vehicle is dry before reapplying it.